For places of interest away from the canal look at Offline interests and Pubs. 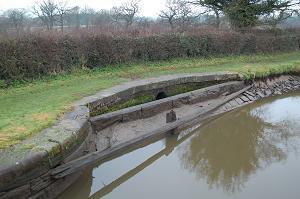 Those who know the Macclesfield Canal have always recognised the unique quality of the side ponds located beside each of the twelve locks. The side ponds have been out of use for their intended purpose for very many years, decades in fact, because we know of no-one who has ever seen them in use. What are side ponds for? They are a water saving device. A lock is emptied first into the side pond and when refilled this same water is the first to be poured back into the lock, thereby reducing the volume taken off the upper pound. A Macclesfield Canal side pond could probably save more than 40% of each lockfull. The efficient design of the locks and associated facilities means that the side ponds are actually built into the bywashes - whenever water flows into a bywash it first fills the side pond before overflowing into the lower bywash and feeding the next pound. The side ponds, like the locks, are all of the same design. In operation every side pond must also be in use. This is necessary because in order to save water every lock in the flight must make the saving - if just one is not saving then there is a total loss of the potential saving of the lock flight. The geometry of a side pond is critical to its ability to save water. If one could build a perfect side pond (and one could not) it would save 50% of the lock water. This would require a pond of infinite area holding half a lock of water in zero depth - that's why it's impossible to build! The design objective must be to accommodate the side pond within an acceptable area, to minimise the depth of the water when the side pond is full, and to put it at a level such that it can be exactly filled by the top half of the lock water and that its entire content will be accommodated within the lower half of the lock when it fills ('half' in this discussion being a nominal half). Of course, no matter how good the design, the effectiveness will vary depending on the levels of water in the upper and lower pounds at the time of use. The Bosley side ponds seem to achieve the very best compromise in terms of area, depth and level relative to the lock. 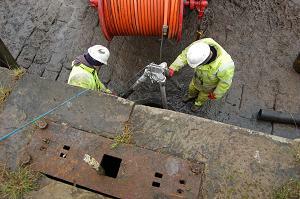 They then have the added benefit of being topped up by any water going over the bywash. Water is transferred between lock and pond via a chamber connecting the bottom of the lock with the bottom of the pond. Control is effected by a paddle operated at the lock side. At Bosley these paddles were on the towpath adjacent to the pond. The rusted skeletons of four remain. 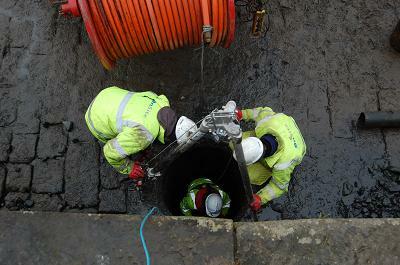 It is important that the chamber connects with the bottom of both lock and pond. Boats ride up and down a lock much better when it is bottom filled or emptied. The pond will empty much quicker when it is bottom drained. There is also the added benefit of retaining water in the bottom of the chamber at all times, avoiding the flow slowing effect of air in the chamber. The paddle between lock and pond has a slightly different job to do when compared with the normal lock paddle. Lock paddles only ever have water pressure on one side, always the same side. A side pond paddle has pressure from one side or the other depending upon whether the lock is full or empty. This means that it must be capable of sealing and sliding on either face. The pressure will be greatest from the lock side, minimal from the pond side. 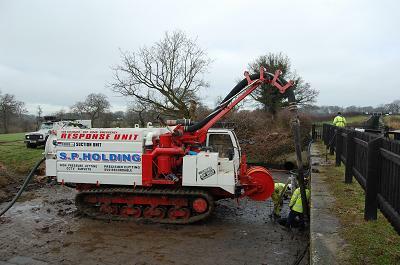 BW have looked at all the side ponds at Bosley and decided that the pond at lock 4 is in the best overall condition and therefore has the best possibility of restoration for use. On its own, of course, it is never going to save water for the flight, but that is not the intention. CRT and the Macclesfield Canal Society want to provide a working example of a side pond for demonstration and heritage reasons. It is not intended that it should be used by boaters in general. The next stage of investigation has been to clear the pond and get the accumulated muck out of the chamber. This will enable a proper inspection of the stonework and the paddle slides. Of course, the chamber is presently bricked up underneath the towpath to prevent the lock water from escaping. If restoration goes ahead this brickwork will need to be removed once the paddle slides have been restored (replaced?) and a new paddle installed. New paddle gear will also be required above ground to operate the paddle. The investigation carried out in December 2008 showed that, on first viewing, the chamber stonework is in good condition (no surprise there, this is Macclesfield stonework!) and that the remains of the paddle are unserviceable - what more would one expect after decades buried in wet mud. One interesting discovery was that the paddle was counterbalanced within the paddle chamber. There are two pulley wheels attached to the underside of the metal plate upon which the paddle gear was mounted. The paddle itself has two hooks on the top of its frame. This suggests that there were two chains attached to the paddle, running up the chamber and over the pulleys and supporting a counterweight. Why did this paddle require a counterweight when none is required for the bottom gates of the lock? Possible reasons include: The paddle was physically heavier than a gate paddle (one pond paddle doing the work of two gate paddles); the paddle shaft is significantly longer than a gate paddle - it is located at least two feet below the invert of the lock; this depth also means a significantly greater weight of water against it - the full depth of the lock (c.13ft) plus about another 4ft, total c.17ft, where a gate paddle is about 10ft below maximum water level. (CRT have yet to survey all these dimensions accurately). Finally, it is not clear what gearing was installed on the paddle gear. Direct drive would have meant a heavy load, with a risk of the paddle crashing to the bottom when being lowered. Hold your mouse pointer over the pictures for a description of each.